I’m not sure how I have lived so long without these…they are definitely a keeper! Another goodie from Isa Chandra…these “snobby joes” are certain to please both vegetarians and meat-eaters alike. We ate them on buns with organic ketchup (way better tasting than regular! ), mustard, and pickles. If you wanted to omit the bread, you could serve them in lettuce wraps. These were SO TASTY. Wow. I tweaked the original recipe a bit…up the chili powder if you like it spicier! Entry filed under: Entree, Sandwich, Uncategorized. I still have got to try out this recipe! It sounds amazing. Oh, those sound good! I’ve actually never had lentils before, but bought a bag because I know they are good for you. I’m going to try these tonight. Awesome! I’ve been looking for ways to use my lentils without eating something boring. Thanks for sharing! I can’t wait to try these out, but I’m wondering, If you were going to substitute the maple syrup with something, what would you suggest? Do you think agave nectar would work? Or honey? Josie…I think it would freeze really well. It’s already “mushy”, so freezing can’t hurt it too much. Go for it! I completely agree about organic ketchup. My husband thinks I am nuts, but Trader Joe’s Organic Ketchup is me and my kids favorite, for sure! We also tried an agave ketchup from the co-op, and it was even better than our normal fave (but waaaaayy pricier). The snobby joe’s look yummeee! This was my first ever attempt at eating a vegan meal (or vegetarian at that! )- and I really liked it! I’m trying to learn how to ease into it all. I know youre doing a Q&A on your other blog, but had a few ‘foody’ related questions. Okay, so I made this tonight – omitted the maple syrup and mustrad (we are out) and they turned out great! We ended up with about 8 “joes” all together. I really enjoyed them. My picky son wouldn’t touch them but said he’d try the leftovers for lunch. DH said they were “okay” – he prefers the sloppy version but liked these. As far as what to do with your meat/cheese, etc…I gave mine away to friends and family. If you don’t have that option…just use it up and start fresh when it’s gone. TheOrganicSister…good to know! Although those 2 flavors are my favorite in the whole recipe!! 🙂 I think they make it much more palatable…kind of the sweet and sour effect. What kind of lentils do you use? green? orange? mix? I cannot WAIT to try these, thank you!!! Kat…I believe I used brown lentils this time and they were great! I’d still love to feed my pet with home made food.One reason is they are feinelg healthy and other is I got fixed income and would like some recipes to try for my dogs. I suspect it would be more cost effective to stay on dog food, however these dogs are older strays who love people food.Thanks for your recipes. putetzfamily: I think it kind of depends on the dish, but lentils are definitely on the mushy side 🙂 I purposely let mine get more mushy for this dish because I like them that way. I’m very anti-crunch. 🙂 I’m always paranoid they aren’t going to get cooked enough, so I tend to overcook them probably….which equals mush. We’ve had these several times in our household as well; as a matter of fact we had them last week (I’m reading this post late)! I like that it uses yummy healthy lentils instead of frozen veggie crumbles. Thanks for the recipes! We are lentil freaks so we will definitely be trying this one. Also, I totally agree about the organic ketchup. It is a gajillion times more delicious that plain ol’ ketchup. Just made these tonight, everyone in the family loved them! I used black eyed peas, since I had a few cups pre-cooked in the fridge, and the joes turned out great! 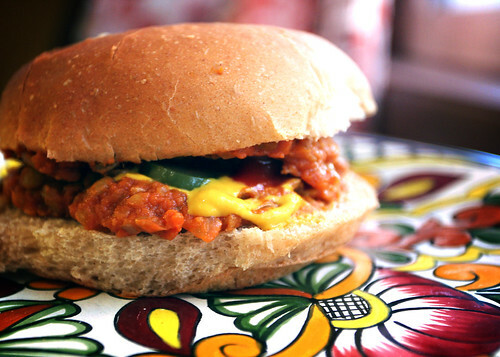 I have never liked Sloppy Joes, but there are delicious! Thanks for posting. This is now one of my favorite dinners! I am a college student and I extremely need an article developed for course. Want to look at a company on-line Buy Essay Online. Has any person tried out a writing solution for a university assignment? These providers maintain to create authentic papers that will not be flagged by teachers. What do you tend to suggest?